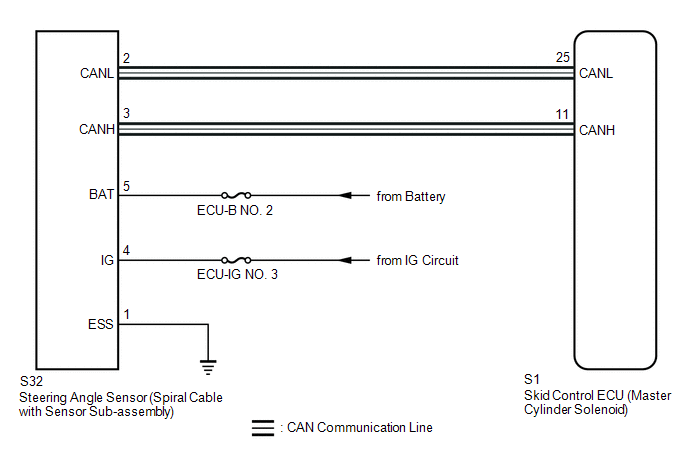 Steering angle sensor (spiral cable with sensor sub-assembly) signals are sent to the skid control ECU (master cylinder solenoid) via the CAN communication system. When there is a malfunction in the CAN communication system, it is detected by the steering angle sensor zero point malfunction diagnostic function. A steering angle sensor power supply malfunction signal is received from the steering angle sensor. 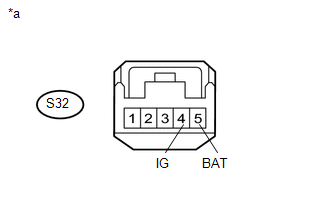 When the speed sensor or the yaw rate and acceleration sensor (airbag sensor assembly) has trouble, DTCs for the steering angle sensor (spiral cable with sensor sub-assembly) may be stored even when the steering angle sensor (spiral cable with sensor sub-assembly) is normal. When DTCs for the speed sensor or yaw rate and acceleration sensor (airbag sensor assembly) are output together with DTCs for the steering angle sensor (spiral cable with sensor sub-assembly), inspect and repair the speed sensor and yaw rate and acceleration sensor (airbag sensor assembly) first, and then inspect and repair the steering angle sensor (spiral cable with sensor sub-assembly). 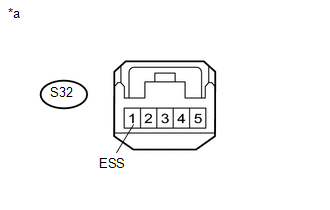 (a) Make sure that there is no looseness in the locking part and connecting part of the connectors. (b) Disconnect the S32 steering angle sensor (spiral cable with sensor sub-assembly) connector.